The Swiss city of Geneva is famed around the world for its natural beauty, as well as for the exceptionally high standard of its hotels, restaurants and bars. However, it’s to the French side of Lake Geneva that many discerning travellers head to enjoy an afternoon of sheer indulgence. 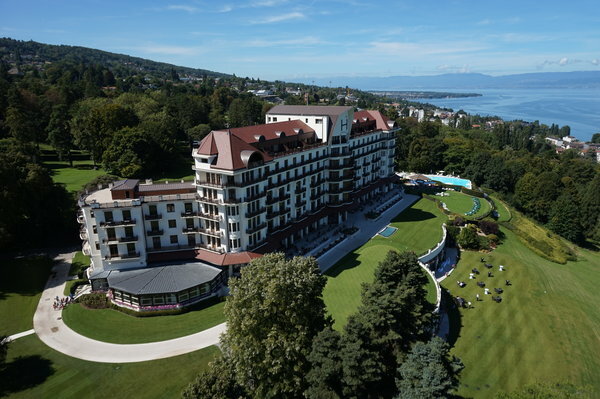 It’s here that you can find the picturesque town of Evian-les-Bains, home to the iconic mineral water brand and, more pertinently, a world-class spa. Spread over 1,200 square metres, the Spa Evian Source takes enormous pride in ensuring all their guests go away feeling completely relaxed and pampered. The main attraction is, of course, the water. Guests can choose between wallowing in a heated indoor pool or heading out to the infinity pool, with stunning views over Lake Geneva and towards the Swiss Alps. Integrated into this large outdoor pool is an innovative ‘Hydro Circuit’, an outdoor course of different current and jets specially designed to exhilarate and invigorate the body and the mind. However, there’s so much more to the Evian spa than water! The facility offers dozens of different treatments, with an ‘A La Carte’ menu for guests to choose from. Some of the most popular of these include steam baths and saunas, while other, more specialist treatments include the incomparable La Prairie treatment for the face and body, which combines a top-to-toe caviar wrap with an innovative pampering ritual that makes full use of locally-sourced Alpine salts, quartz and essences. Alternatively, the popular Thai and Ayurvedic rituals combine local expertise with exotic methods, giving guests the chance to go on a journey of decadence and self-discovery in the midst of some of the most spectacular natural scenery in the whole of Europe. Once the health and wellbeing treatments are done, guests then have the chance to give themselves a further boost at the in-house beauty or hair salons, and then indulge themselves at one of the acclaimed restaurants at the Evian resort, toasting this beautiful corner of France with a glass of the famed local water, or perhaps something a bit stronger!